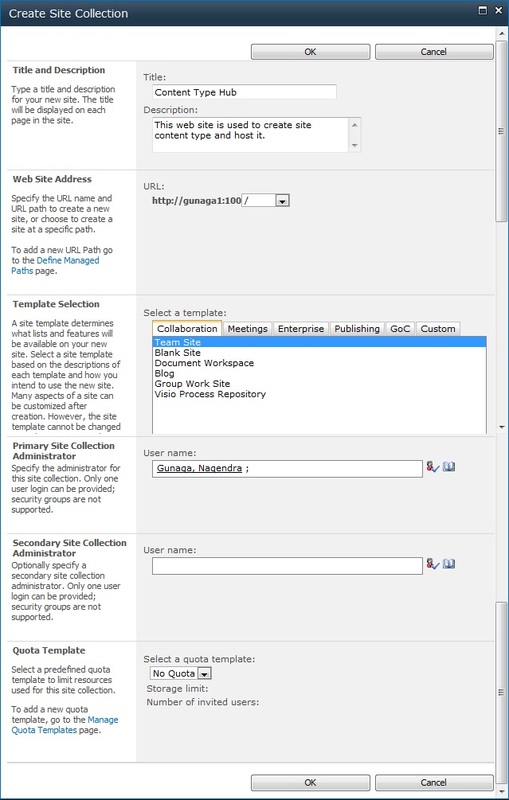 SharePoint 2010 introduces a new concept called Content Type Hub. 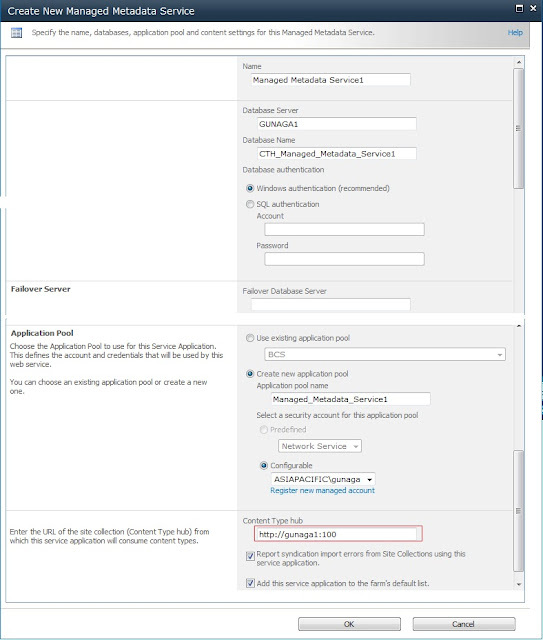 This is the way of making centralized content types and re-usable in the SharePoint farm. This is one of the huge improvements from MOSS 2007 both in terms of management of content types and overall flexibility that comes with it. Content type created in one site collection cannot be shared to other site collections of same web application or another web application in MOSS 2007. With SharePoint 2010, this limitation is resolved and with content type hub feature, content types can be created and published and can be re-used/shared across the web applications. In a nutshell, content type hub follow the publisher-subscriber process model were content types are published by content type hub through metadata service and subscribers are the web applications in the SharePoint farm. Finally the site collections present in the web application which subscribes the metadata service will get this content type. We will be focusing the below points during the implementation. 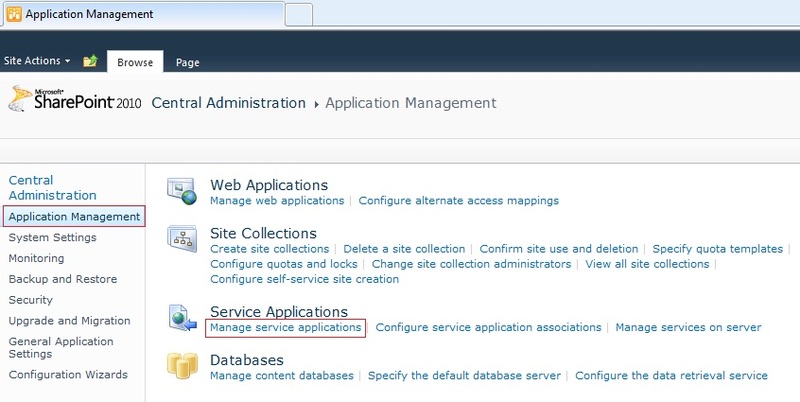 Open Central Admin Site and Create New Web Application. See the below image for more information. Open Central Admin Site. Go to 'Application Management' --> 'Manage Service Application' under 'Service Applications' section. Look for 'Managed Metadata Service' in the list. If not present create one. See the below image. If already exist, select 'Managed Metadata Service' and click in 'Properties' in the ribbon. Enter 'Content Type Hub' URL as created in step 1. 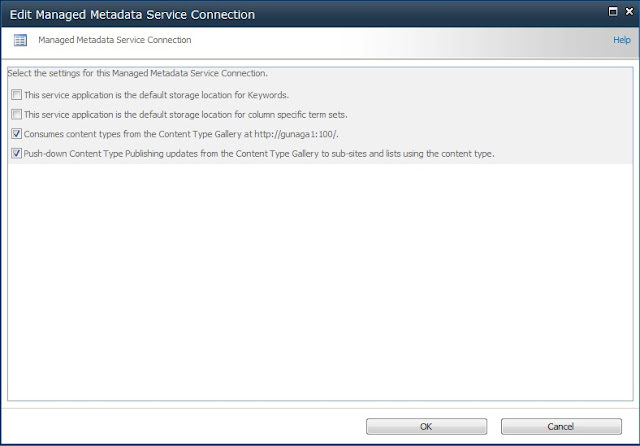 Select 'Managed Metadata Service' with type 'Managed Metadata Service Connection' and click on 'Properties' in the ribbon. Make sure the selection of check boxes shown as per below image. Browse to Site Collection created in step 2. The name of the site collection site is 'Content Type Hub'. Go to 'Site Actions' --> 'Settings'. Select 'Site Content Types' link under 'Galleries' section. Create new content type. See the below image. Create columns for the 'CTCentralized' content type created in above step. I have created two new columns using 'Add from new column' option. They are 'Phone Number' and 'Zip Code'. See the below image. Click on 'Manage Publishing for this Content Type' link present under the 'Settings' section. See the below image. Select 'Publish' option and click 'OK' button. See the below image. Click on 'Monitoring' --> 'Check job status' link present under 'Timer Jobs'. Find below timer jobs and select it and run it. 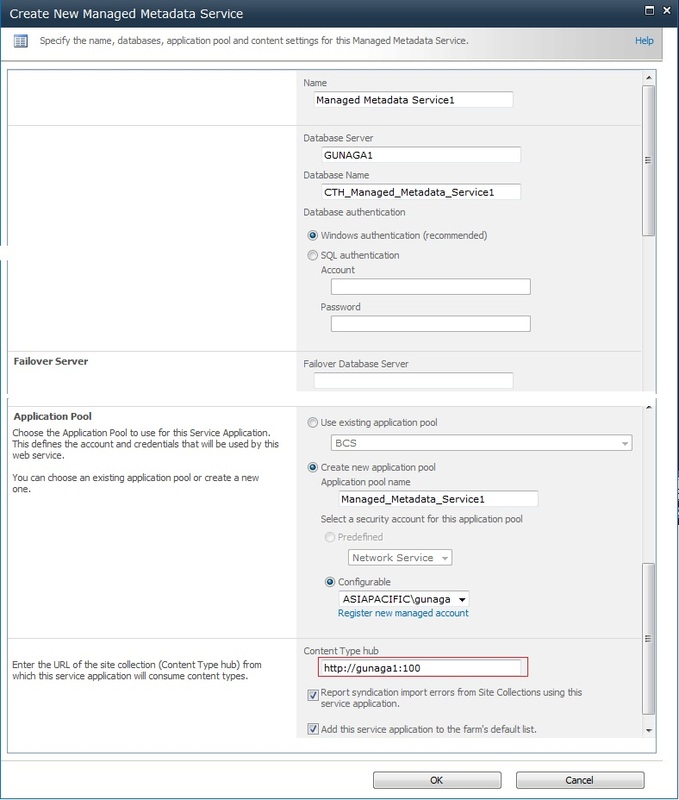 Create another web application or another site collection and follow the steps defined in section 2. I have created new web application with site collection name 'Content Type Hub Test'. You should be able to see the content types. See the below images.